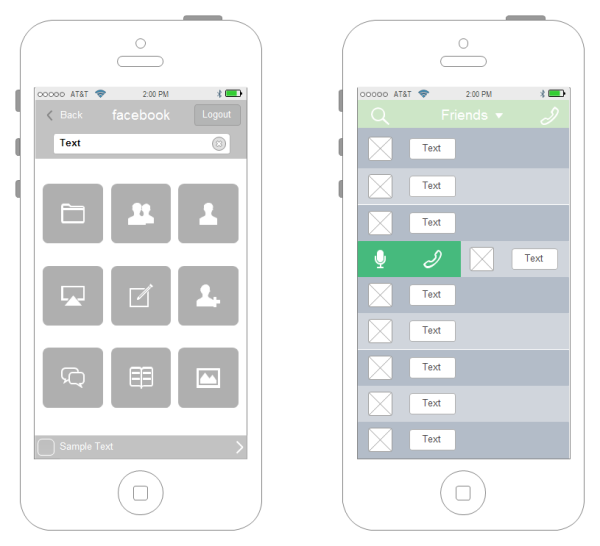 A fast and effective iPhone UI wireframing tool allows you to create iPhone ui from built-in UI elements and templates. Experience an easy way for iPhone UI prototyping. A great iPhone UI wireframing tool is provided through which users can make excellent UI wireframes using built-in iPhone UI elements. When opening the software, you will get an instant access to a large collection of pre-made iPhone UI elements and symbols. Simply drag and drop UI elements to the page, then rearrange and resize. You will gain a high-quality iphone UI wireframe with just a few minutes. 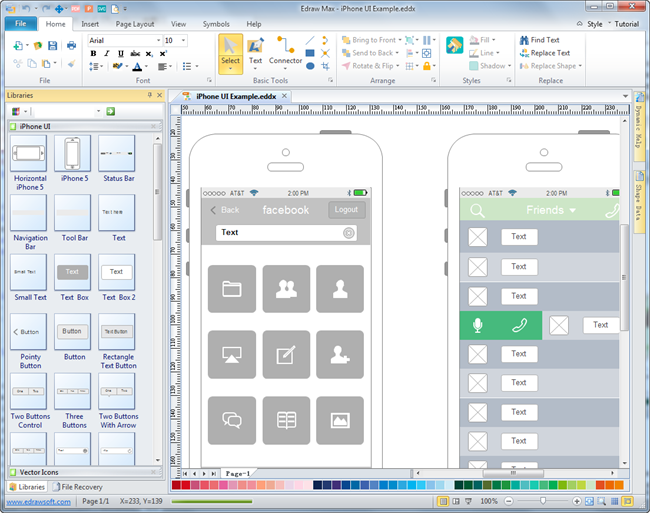 As the picture shows below, Edraw iphone UI wireframing software has a simple and intuitive users interface, which has a close similarity with Microsoft program. As long as you can use a word, you can handle this software. It's very easy to use and easy to learn. When finish, you can export your design to PDF, PPT, Word, Html, SVG, PNG and many other formats with a single click. A big time saver for UI design with built-in predefined symbols and pre-drawn templates. Our wireframe stencil kit is comprised of all the vector wireframing elements you might need to create iPhone UI wireframe. great helper for novice users with drag-and-drop interface and point-and-click editor. Vector format elements for high quality outputs. Automatic formatting tools to make users instantly productive. Broad file format compatibility allows seamless collaboration. 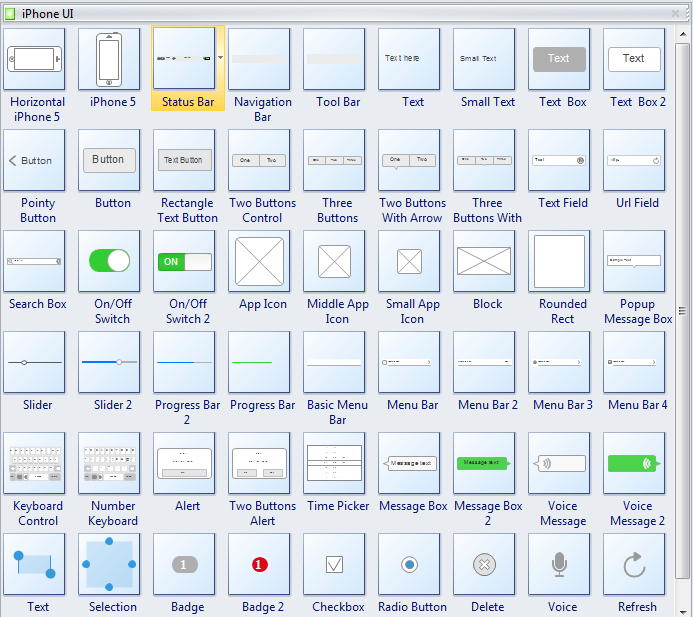 From the built-in iPhone UI symbols library, you can get a great range of high quality ready-made symbols, such as status bar, navigation bar, tool bar, text box, button, on/off switch, app icon, text field, slider, key board, progress bar, voice message, etc. To learn more about each iPhone UI symbol, please click iPhone UI Symbols for further information. Some of the iphone UI symbols are designed with smart buttons, through which you can change the symbol style with one click, effective and time-saving. The sliders and progress bars have yellow control handles, through which you can change the progress status. Choose Wireframe category under Available Templates. Double click the icon of iPhone UI in the Templates window. From the opened iPhone UI Library on the left of the canvas, drag and drop the necessary elements, resize and arrange the elements. When you finish, go to File tab, and click Export to choose a suitable export option and export the file. To have a complete and detailed guide, please click how to create an iPhone UI wireframe. Below are examples of iPhone UI wireframe designed by Edraw. They are finished in just a few minutes.